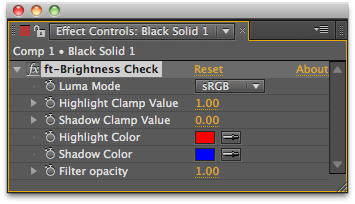 Apply the filter on a comp or adjustment layer, and place a level or exposure or curve filter above it. In the example project included with the plugin, if you open the RENDER comp, you will see that the "ft-Brightness Check" is applied on the "footage" comp, and the filter is already applied to it. By just activating the Level which is just above, you will see that the "error" will disappear.